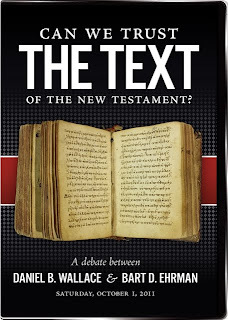 The cover of the DVD containing last Fall’s Wallace-Ehrman Debate, “Can we Trust the Text of the New Testament” (mentioned on this blog on 11 Nov 2011) features a manuscript containing a Greek minuscule text, written in quite a neat hand. The only problem is that — in relation to the title of the debate — the MS pictured is not to be trusted for the purpose stated. I pointed this out to Dan, and he assured me that he had nothing to do with the packaging of the DVD (nor, I presume, with the selection of the same manuscript pages for flyer and poster promotion of the debate). So, as an interesting challenge, what text is actually displayed in the photograph? I know, and Dan knows, but do you? This text is about abbot Pachomius - an incredibly remote NT character. Searching TLG for "αυτοις δια τι υμεις" yields a single hit: Sancti Pachomii vita tertia. And of course those answers are correct (Pachomius' name does appear within the MS pages displayed). Yet I wonder how long it might have taken without TLG to get the definitive answer? TLG sort of takes all the fun out of diligent searching. 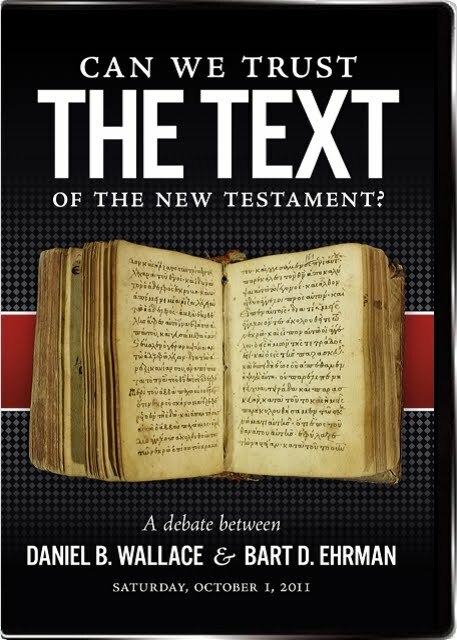 But the larger question remains as to why and how such an obscure text ended up illustrating the debate as to whether we can trust the text of the New Testament, given that the photo selected is totally irrelevant. I have no clue as to who might be able to explain that faux pas. I guess it could be worse, instead of including a non-sequitir, the could have included Goodspeed MS 972. Archaic Mark was my first thought, but this scribe did not abbreviate the articles. Doesn't the Rule of Pachomius have a load of stuff about memorising the text of the Bible? I think that Pachomius' rule for leaving books open (while not reading) should be observed in Tyndale. All guilty persons should be taken in front of the facility and be beaten with sticks. Pretty much, stick-beating seems to have been the solution for a lot of things, if I remember correctly. Given that the MS relates to the life of Pachomius, what incident is being described in the pages displayed, and to what purpose? But--what's wrong with citing 2427 as a trustworthy repository of the Original Text of the New Testament? I certainly thought that was the idea when it was included as a constant witness in NA-27. 2427 is a hand-written copy of a 19th cen. printed edition of the New Testament in Mark. Well folks as the one responsible for the faux pas, I can assure you this manuscript has a New Testament text (though it's text is not in the photo). So to continue the quiz, any guesses as to the New Testament text this manuscript contains? I'll be happy to reveal why and how this MS was chosen once someone guesses the right answer. I find it terribly comforting that I'm not alone in doing this with Greek text on the printed covers of books/DVDs. I'll have to point to this and hope my wife will find that equally comforting. This kind of things actually happen almost everyday in many publications, the dissonance between the titles (and contents) and covers. A good example would be the Brill and SBL series where they apparently adopt only one illustrated cover style for all the books in the series. For instance, James Royse's majestic monograph is clearly about early papyri but the manuscript in the cover is a parchment! Of course, this is not James' doing but must have been the decision of the publisher/s. π’ αὐτοῦ καὶ γευσώμεθα ὁμοῦ. ται τὸ πν(εῦμ)α τοῦ Θ(εο)ῦ ἐπὶ σέ, ἀδελφέ. The incident related in the displayed text concerns Pachomius seeing a corpse being carried through the streets, with two angels following and praising the dead man. When Pachomius asks them why they are doing so, the answer is that the deceased had always kept the Wednesday and Friday fasts. Okay, I guess no one's going to guess. This is a photo of GA 2377 which has 10 leaves of Revelation 19:21–22:21. The shot was taken this way for aesthetic reasons; not to mislead. Manuscript 2030 (in Moscow, not Athens like 2377) only has Rev 16:20-22:21. And Schmid described only Rev 13:10-14:4 of 2377 as being K-text, not the rest of 2377. Also, I’m curious if you’ve ever been able to compare images of 2030 and 2377? Schmid says their text is identical... but they’re dated to the 12th and 14th centuries, respectively... have you been able to compare the handwriting? I recently got to compare images of 792 and 2643 and was fascinated to see the hand of the same scribe in both... but granted those are from the same century. Peter, I'm curious about the csntm entry for 2377. It says that by agreement with the ms' custodian that the images will not be available online. 2) if they do not want the images posted online, did they mind one being published on a cover? Jeff and Ryan, those are good questions but not ones that I'm able to answer. You are better off emailing someone from CSNTM. Thanks.